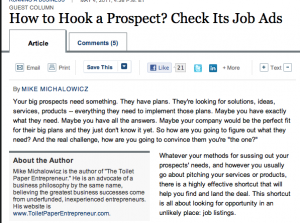 Great WSJ article on how to hook a prospect – look at their job ads! 1) What’s the company language and culture? 2) Does the company keep hiring for the same positions? Maybe they could outsource some functions (to you). 3) What pain points does the company have? If they’re hiring people for collections or inside sales, are there productivity tools or consulting services that could help them? 4) Many job ads mention new locations or branch offices. Sales people call these “greenfield” opportunities because there are so many services across the board that new locations/branches/offices require. A great article for people who sell for a small business. Sometimes, you can find great tactics just by reading.. This entry was posted in Marketing, Small Business and tagged how to hook a prospect, job ads, prospects, wall street journal by John Sung Kim. Bookmark the permalink.